Coney Island is a name synonymous with its famous amusement park grounds which play an important part in New York history. 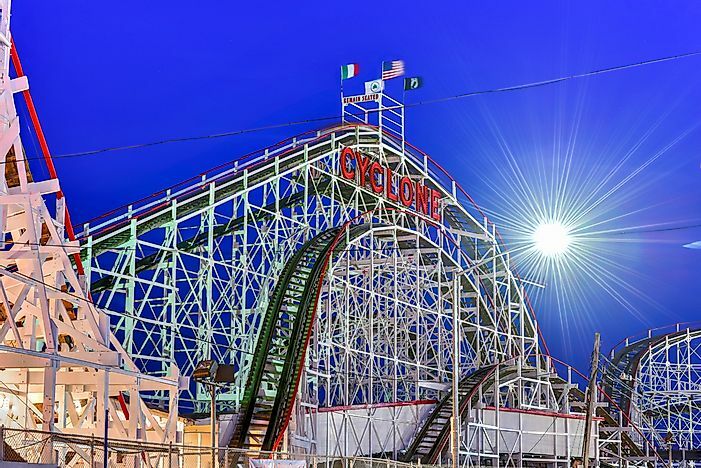 Cyclone roller coaster, Coney Island. In 1876 Danish-American Charles I.D. Looff (1852-1918) constructed the first ever amusement ride on Coney Island, a carousel. Until World War II, Coney Island was a major tourist destination and the largest amusement area in the nation. At its height Coney Island boasted three major competing amusement parks: Steeplechase Park (1897-1964), Dreamland (1904-11) and Luna Park (1903-46). Over time, new innovative rides were added like the roller coaster, Parachute Jump and the Wonder Wheel. Besides its amusement parks, the new and convenient access to transportation made the island a popular beach destination for New Yorkers and tourists alike who were looking to escape the summer heat. Throughout its heyday, Coney Island was a tourism hub for people in and around New York City, particularly for the upper class. In 1847 a ferry line was introduced to the island, bringing in more middle class visitors. In the following decades following the Civil War (1861-65) the area attracted more wealthy investors who wanted to build more hotel properties. Accessibility to the island increased as it was connected to the outside world via railroad and steamboat. Today Coney Island has two major amusement parks. Luna Island, which was opened in 2010 and Deno's Wonder Wheel Amusement Park, which started in 1976. In 2011 the first new roller coasters were built on Coney Island in eighty years. Coney Island also had three rides that are part of the National Register of Historic Places and are protected landmarks. The Wonder Wheel (1918) and The Cyclone roller coaster (1927) are both still operational to this day. The Parachute Jump has been closed since 1968 and is the only part of Steeplechase Park left. The New York Aquarium is a popular attraction on the island, as is MCU Park which is home to the minor league Brooklyn Cyclones baseball team. Coney Island USA helps to sponsor annual events like the Coney Island Film festival and the Coney Island Mermaid Parade, as well as housing the site of the Coney Island Museum. Coney Island is also known for housing Nathan's Famous Corporation's original location and the annual 4th of July Nathan's hot dog eating contest that has taken place since 1972. The fall in Coney Island's popularity was rapid after World War II as Luna Park was badly damaged in a 1944 fire and forced to close two years later. The rise of air conditioning in movie theaters and homes led to residents staying indoors or opting to go to the theater over amusement parks. Automobiles and better road infrastructure led to greater accessibility to state parks and spacious beaches of Long Island instead of Coney Island. In the 1950s street gang problems came to the area, discouraging visitors from going to the amusement parks where they hung out. By 1964 the local economy had declined so sharply that the famous Steeplechase Park closed. In 1946 Robert Moses (1888-1981) had Luna Park demolished to have the land rezoned to serve as a low-income housing apartment complex which would also deter people from visiting the island by the 1970s. By 1949 Moses demolished many amusements to clear land to build the Abe Stark Rink and the new location for the New York Aquarium. Eventually critics and Moses came to a head when he wanted the entire peninsula rezoned and this led to a protected area for amusement use only. In the following decades this debate over land use, construction rights, amusements, property value and what would be built in the area would be fought over by the likes of Fred Trump, Horace Bullard, the NYC Planning Commission, the state legislature, rich casino owners and other various corporations.